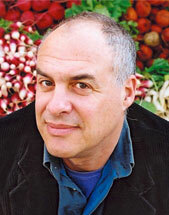 Mark Bittman, one of the country's best-known and widely admired food writers and television personalities, is known for his candor, straightforward, no-nonsense style, and simple recipes. He is the creator of the beloved New York Times cooking column "The Minimalist," accompanying web videos, and daily blog; he's the author of several blockbuster cookbooks; and he appears regularly on both commercial and public television, where he has his own series. Mr. Bittman's best-selling How to Cook Everything (which won the IACP/Julia Child award, the James Beard award, and three international cookbook awards) is the bible of basic cooking for millions of Americans. How to Cook Everything Vegetarian (winner of an IACP/Julia Child award and nominee for a James Beard award) was one of the best-selling cookbooks of 2007. In addition to his writing, Mr. Bittman is also the host of the public television series "Bittman Takes on America's Chefs," which first aired in spring 2005 and won the James Beard Award for the best cooking series of 2005. The second season, "The Best Recipes in the World," followed soon after. His third PBS series, with Gwyneth Paltrow and Mario Batali, called "Spain: On the Road Again," was also a success. He also often appears on NBC's Today Show. In the late 1990s, Mr. Bittman created a best-selling collaboration with the internationally celebrated chef, Jean-Georges Vongerichten. Their classic, "Jean-Georges: Cooking at Home with a Four-Star Chef," is widely considered to be among the most accessible chef's cookbooks ever published. Mr. Bittman's first book, "Fish-The Complete Guide to Buying and Cooking" is the best-selling contemporary book on the subject. Among his other works are the blockbuster "The Best Recipes in the World" and the award-winning "Minimalist" cookbooks, now collected in Mark Bittman's "Simple and Easy Recipes from the New York Times."